During Tuesday’s assessment, I had to walk the treadmill for about 12 minutes for the VO2 test. It got pretty fast and also went up on an incline, and about 10 minutes in, my knee started to hurt. So I’m back on the recumbent bike downstairs for a spell. I don’t know if I mentioned this in a previous post, but about 12 years ago, my knee dislocated. AGH, I get the creeps even thinking about it. I ended up arthroscopic lateral release, a surgical procedure used to help realign the kneecap. I haven’t had another dislocation since, but every time my knee aches or feels unstable, I get a little panicky that it will dislocate again. The trainers at Doctors Wellness Center have been aware of the issue and working with me since I started. I have strengthening exercises that I do every night, and the trainers have been working to strengthen the knee and quads, too. They are also aware of the issue and check in on it on a regular basis. 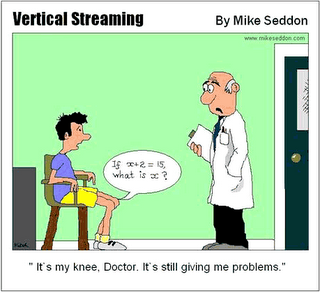 In the past couple of days, I’ve had a new, strange sensation in my knee. Occasionally, it feels like water is running down it and/or it is wet, but neither of these are really happening. I’m not sure if there is fluid in my knee or what. I think on Monday that I will go over to the Midlands Orthopaedics “Ortho PM” clinic after work to have someone take a look. I suspect it is arthritis or something totally treatable, but I want to have it examined for peace of mind. Tagged Aches and Pains, Knee. Bookmark the permalink.